We have been cleaning up a messy room together. This room happens to be in my house.A family member moved out, and needed help getting the room together, she was so busy, and things had gotten a bit out of control, so I volunteered… with an ulterior (Tidy Tutor) motive. I began to think lots of us have rooms that are a disaster like this, and we feel FROZEN not knowing where to start! So VOILA(don’t you wish it was spelled WA-LA?) a video series was born! I kinda blew by the laundry part of our “working together” instruction, and also didn’t address the clothing there might be in the room. The clothes in this room were not mine. There weren’t many dirty clothes for me to deal with in there, and the other clothes that were still in drawers and the closet did not belong to me, so all I had to do was box them up. The first week we worked on the surfaces, the second week we did laundry and took care of all of the stuff on the floor. Since then we have washed windows, hung curtains, made the bed, moved furniture and took care of the walls. We can only keep what fits in the space we’ve got. Laundry needs to be done on a regular basis. We have to get ruthless with ourselves in deciding what to keep and what to get rid of. Realize that “TOO MUCH STUFF” is our biggest problem. We ask ourselves for each item we pick up: Do I don’t LOVE IT? Does it fit me? Do I wear it? If the answer is no to any of those questions… those things go. Now what if you are IN LOVE with way too many of those things, and they fit you, BUT there is no room for them all? Be selective. Be very selective. To be brutally truthful, I don’t really believe that is true. I’ll bet there are lots of those items you never wear. 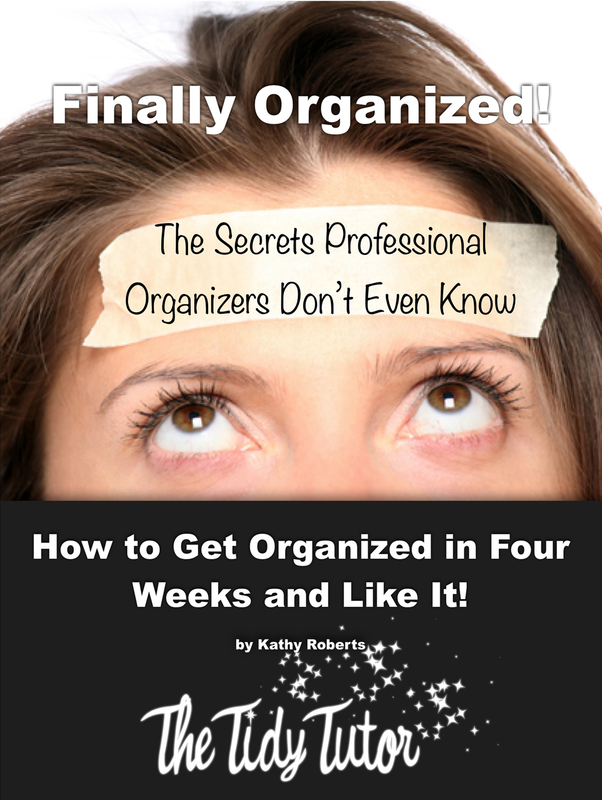 Remember YOU CAN NOT ORGANIZE CLUTTER, and OUR NUMBER ONE PROBLEM IS TOO MUCH STUFF! We can not keep what doesn’t fit in the room. Make a decision now to let go. To live differently. To begin to practice the art of living an organized life. It is an art. It is your life and your home is the canvas. Paint your world beautiful! Love yourself enough to let go of things, because what you are doing is making room for what you really want to come to you. Let me know how you do. Send me pictures. It will inspire others and I will surely give you cyber hi-fives! Love these step by step instructions! My biggest option is my clothes..I have clothes from 1985! First week i thought I was hard on myself,and threw a lot away. But with another mindset…it is still difficult. I´m working on it! I need this motivation so much. I’m so glad you got rid of them! I hope you will join our challenge! It will help so much!!! Cathy i have a cronic illness…i feel that my home is in shambles. The kids are grown and gone but always leaving thing behind. I have that to deal with also. They travel and my home is chosen because they do no want to lose their(whatever). There will be times when i can go nothing but when i can i will be busy. I am starting with my bath and bedroom (master). Thank you for all of your motovation i really need it!!! I understand about kids thinking they can use our homes as their dumping ground or storage shed. It’s because they think it is their home. We have to help them realize that it’s your house. Start by telling them that you are cleaning up the house and they have till ________ to get their stuff. They aren’t going to believe you, so they won’t come. Then you tell them. OK – I’m putting your things on the curb on this date. They will get mad at you. But they love you always. We teach people how to treat us and it’s time to start re-teaching. I’m sorry about the chronic illness 🙁 I know how hard it is to get out of the mess when you are not well. You can do it though! Thanks for the comment, Please keep in touch!